Following Brexit and the continued stagnation of the oil and gas price, 2016 will long be remembered for all the wrong reasons. However, despite the rather gloomy past, 2017 is shaping up to be a far better year for the industry. With advancements in technology and testing, 2017 is set to see new, green shoots of growth return to the sector. As many multinational companies hire UK employees to work in the EU and vice versa, Brexit has so far cast a shadow over the recruitment process. The potential for UK citizens to become non-EU citizens is likely to increase bureaucracy and therefore the cost of employing them. The use of UK workers in EU countries could become less attractive and add further pressure to the already volatile job market. There are also the continued uncertainties of what Brexit may mean for new trade deals. How quickly and smoothly these deals are negotiated, could have a knock-on effect to the oil and gas industry. However, another big issue we could see is that of the withdrawal of Research & Development (R&D) spending in the sector. The UK currently has access to a large EU R&D budget which UK companies can tap into to help develop new products and technologies. An example of such funding for projects is Horizon 2020, The EU framework programme for research and innovation. How the government fills this R&D funding gap will be crucial to the success of the UK oil and gas industry. Played correctly and the UK market could be well placed to be a world leader in oil and gas technology and innovation. Following Brexit, we could see the UK carve out it’s own trade deals as it leaves the single market, which might bring additional, unexpected benefits. Along with the cutting of funding with Brexit, the low price of oil has also had a massive effect on the level of investment going into R&D. Decreasing investment in R&D hampers the potential to find ways to keep existing oilfields open and reduce the cost of oil production. However, technologies and solutions are being developed which can lower the cost of oil extraction and production to not only offer increased profitability for businesses but also help maintain the current employment levels in the UK oil and gas sector. One exciting set of new technologies that is emerging is for subsea extraction and production. Already we are seeing new systems being deployed for subsea use. This is likely to increase greatly in the coming years, with the eventual deployment for a full subsea extraction and production facility on the seabed. Reaching this level though will require fluid dynamics expertise to ensure systems can operate and deliver an ROI in these extreme conditions. Even before Brexit took hold earlier this year, there was already growing interest in UK decommissioning following the drop in oil price. In fact, industry body Oil and Gas UK is predicting that between now and 2024, the UK decommissioning market will grow to be worth £16.9 billion, more than 16% higher than what was predicted in 2014. With around a third of operating platforms now beyond their 30-year life cycle, the UK decommissioning sector has a lot of room for growth. 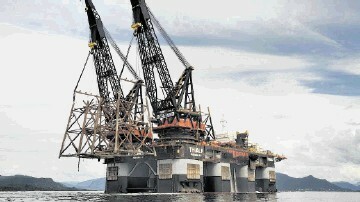 In fact, Royal Dutch Shell fully expects decommissioning to continue for at least another 10 years at its Brent Field. The particular challenges of the North Sea will mean that the skills and technology developed here will be of enormous use to global decommissioning projects in the future. For instance, new waterjet cutting technologies which can cut in difficult and confined conditions – like those found on an oil rig – will enable decommissioning teams to operate more quickly and easily. In particular, cold cutting water jet technologies can now be operated around 1km from where the actual cutting is taking place. And with its ability to operate both on land, underwater and in potentially explosive environments, it is perfectly placed to help decommission the North Sea and help lead the UK into a new age of decommissioning excellence. As more fields go offline, the skills and technologies developed in the UK will likely be in high demand. There is certainly economic and political uncertainty in the sector, typified by the price of oil and Brexit. Nonetheless, a totally gloomy view of the situation does not take into account that private investment is unlikely to be reduced, though success will require the government to make firm steps in assuring that it helps and invests in the sector. British innovation has long been a leader in the world. It simply needs some support to allow it to continue to be.